Download high-res maps… Go catch more and bigger fish. Three simple steps to better fishing. “Log Sonar”. Doing so will record to the mini-SD card a sonar log that includes all the depth, vegetation and bottom-hardness data within the sonar cone emitting from your transducer. Record a new sonar log every hour or so on the water, because the Genesis servers can more quickly process 6 one-hour files than one 6-hour file. 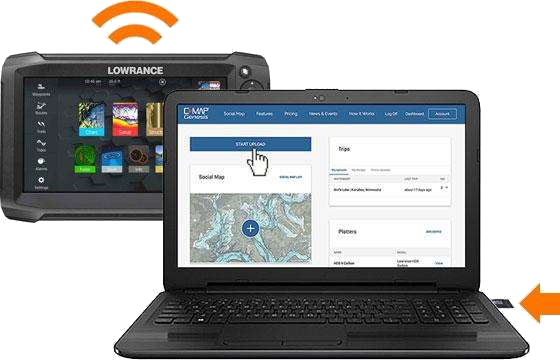 If you have a wi-fi enabled fish-finder running the latest software, your sonar recordings will automatically upload to C-MAP Genesis when your unit connects with wifi. If you have an unlimited mobile data plan and good cell service, you can do this from your boat, on the water. The other way to upload your sonar logs is to remove your mini-SD card from your fish-finder, insert it into your computer and then log-in to GenesisMaps.com and upload it through the Dashboard by clicking the “Start Upload” button. C-MAP Genesis will automatically create a downloadable map file from each sonar log file you upload. You will receive an email when each file finishes processing. The upload process may take a few hours depending on how large the file is. If you uploaded multiple files from the same waterbody, you can easily merge them into a single downloadable map file to save on your mini-SD card and use in your fish-finder on the water. Now go catch more & bigger fish! Now that you’ve got a better contour map that you can be confident is accurate, because you controlled the survey process – go fishing! The productive portions will stand out on your map: humps and holes, reefs and shoals, drains and ditches, ledges and breaklines. 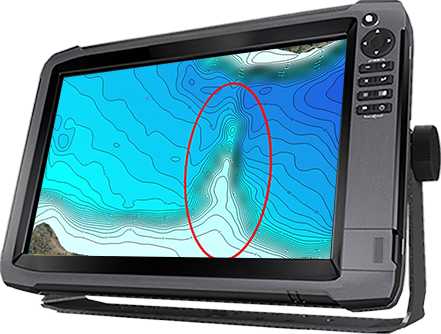 With features like custom-colored contours, vegetation layers or bottom-hardness layers you’ll be able to target areas unknown to other anglers and you’ll catch more and bigger fish.